Pimento.—Fruit of a species of Capsicum, and much used in flavoring. There are several varieties, all found in the valleys of Yungas, the most piquant being that called Vlupiqua, having the size and form of a pea, with a red or green color. That called Locoto is the size of a small egg, and is nearly as strong in flavor as the preceding. The Chinche resembles the Vlupiqua, but is larger. The Aji verde is long and pointed and is less piquant than the above varieties, but is deliciously perfumed and of a fine red color when ripe. A somewhat larger variety of this is brought dried from Peru, and has an orange shade. The Aji palpa is of a dark red, almost black when dried, and is used for coloring dishes, etc., since its piquant taste is barely perceptible; it grows to the length of about 4 inches. From: Report on the Agriculture of South America: With Maps and Latest Statistics of Trade, by Almont Barnes. U.S. Dept. of Agriculture, Division of Statistics, 1892. Aji or uchu, a Chile pepper with a very peculiar flavour (Capsicum frutescens, Lin. ), is the favourite condiment of the Peruvian Indians, sometimes eaten green, and sometimes dried and pounded. The consumption of aji is greater than that of salt; for with two-thirds of the dishes, more of the former than of the latter is used. The aji pepper was introduced into India by Mrs. Clements Markham in 1801. From: The Travels of Pedro de Cieza de Léon, A.D. 1532-50: Contained in the First Part of his Chronicle of Peru. By Pedro de Cieza de León, translated and edited by Sir Clements Robert Markham. London: Printed for the Hakluyt Society, 1864. From: Kew Bulletin, Royal Botanic Gardens, Kew: H. M. Stationery Office, 1897. Peppers.—There seems to be now scarcely a doubt as to the American origin of the peppers, Capsicum sp. It seems, however, to have escaped the attention that it deserves, that the large number of forms already developed at the time of the discovery of America is indicative of a long cultivation, and adds testimony to the agricultural habits of the people. A vernacular name, especially if short, is very persistent in its horticultural use, and in those varieties of vegetables which are grown in kitchen gardens, some names alone, without descriptive text, may be assumed as indicative of the existence of a variety to which the same name is applied to-day. Such investigations as we have made indicate that this is especially true for the peppers. How many species there are of peppers I cannot make out. Many described species can be unhesitatingly referred to Capsicum annuum, a species of great variability, and which seems to be a perennial in some regions, as in Florida, as I am informed, and in Chile, according to Molina. We shall make use of the specific names as we find them. According to Bancroft the use of peppers by the Southern natives was as great in ancient times as is now observed. Sahagun mentions chili more frequently than any other herb among the edible dishes of the Aztecs; Veytia says the Olmecs raised chili before the time of the Toltecs. It is the principal sauce and the only spice of the Indians” as Acosta writes in 1578, and Schomburgh says that the present Indians of Guiana eat the fruit of these plants in such abundance as would not be credited by an European unless he were to see it. Columbus carried peppers with him on his return voyage in 1493,* and Peter Martyr, in his epistle dated September, 1493, says it was “more pungent than that from Caucasus.” In 1494 a letter written by Chanca, physician to the fleet of Columbus on his second voyage, to the Chapter of Seville, refers to its use as a condiment. Capsicum and its uses are more particularly described by Oviedo, who reached tropical America from Spain in 1514. Clusius asserts the plant was brought from Pernambuco by the Portuguese to India, and he saw it cultivated in Moravia, in I585. Capsicum annuum L., has never been found wild, but C. frutescens Willd. has been found wild, apparently indigenous, in South America. De Martius brought it from the banks of the Amazon, Poeppig from the province of Maynas in Peru, and Blanchet from the province of Bahia. The form, C. indicum Rumph. = C. frutescens L., is said by Ainslie to be constantly found in a wild state in the islands of the Eastern archipelago. Capsicum annuum L.—According to Naudin C. longum DC., and C. grossum Willd., are not specifically distinct from this plant It is said by Clusius to have been brought by the Portuguese from Brazil to India, and reached England in 1548; and is mentioned by Gerarde as being under cultivation in his time. The fruit is variable in form and color, as is also the plant. It was mentioned by Louriero (1790 or 1798) as a cultivated plant of Southern China, but has not been noticed by the Chinese writers of the sixteenth century or in others of more recent date, although nowadays much cultivated in China. C. baccatum L. Bird pepper, according to Miller, and synonymous with C. frutescens var. L., C. fructu minimo conico rubro. Brown, etc., and described among Jamaica plants by Sloane and Brown, in Amboina by Rumphius (1750), and as C. brazilianum Clusius (1601). It differs little from C. frutescens, and the berries are very pungent. Bird pepper is mentioned by name by Long in Jamaica, and by Wafer for the Isthmus ; is perhaps the pepper ” as large as haws ” described in Brazil by Hans Stade. It has been in England since I73I, and a “bird orWest Indian” was in American gardens preceding 1828. It is mentioned as well known in India by Firminger and Drury, but I do not identify it with any of the present varieties of our seed catalogues. From an uncertain authority it is said to grow wild from Southern Texas to Arizona, but it is not catalogued in the report on the plants of the “United States and Mexican Boundary Survey,” 1858, unless it be synonymous with C. microphyllum Dun. C. cerasifonne Mill.—Cherry pepper, also described by Tournefort, 1700. It was sent from the West Indies. It is probably one of the sorts described for Peru by Garcilasso de la Vega under the name chinchi uchu. It is also among the names listed by Long for Jamaica, and was in American gardens in 1806 or before. 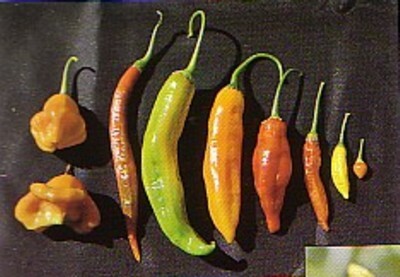 It is a variety of C. annuum, and the fruit is quite variable in form and color, some sorts being yellow. The form figured in Hortus Eystellensis, 1613, is precisely the cherry pepper of our gardens. C. conoides Mill.—Came to Miller from Antigua under the name of hen pepper. This is a name which appears in Long’s list of Jamaica sorts. The description of the fruit would answer to that of the oxheart of some of our seed catalogues. C. cordiforme Mill., or heart-shaped Guinea pepper, was also described by Tournefort, I7OO. It has several varieties, the fruits varying in size, shape and color, some sorts bearing yellow. It can be referred to C. annuum, and seems to be the oxheart of some of our seedsmen. C. fastigiatum Blume, syn. C. minimum Roxb.—It is the C. frutescens L. Spec. Plant., but not of L. Hort. Clif., to which the name C. frutescens is usually applied.1 It occurs abundantly wild in Southern India, and is extensively cultivated in tropical Africa and America. According to Miller it is C. indicum Rumph. (Amboyna), and the Capo-molago of Reede (Malabar) which fixes its presence in the East Indies about 1700. It is described by Loureiro, and was in England in 1656. It does not appear to be among the species grown in American gardens, all of which can be referred to C. annuum. C. frutescens L. — This has been called barbary, cayenne, shrubby and goat pepper. It seems to have occurred in our seed catalogues under the name of True Cayenne, but does not appear to be cultivated with us now. It was in English gardens in 1656 and seems to have been called barbary from the size and shape of its fruit, which are like those of a berberry. It seems to be cultivated and to have native names in Haiti, Peru, Mexico, India, Burma, Malabar, Ceylon, Yemen, Greece, Egypt, &c., and furnishes much pod pepper to commerce. It has been found wild from Bahia to Eastern Peru in tropical America. In Ceylon a red, a yellow and a black fruited form are known. C. grossum Willd.—This is the pepper with large sweet square fruits, and furnishes many varieties and synonyms to our seed catalogues, and is considered to be but a form of C. annuum. It may be the rocot uchu of G. de Vega. It was, according to Miller’s Dictionary, described by Besleri in 1613, by Bauhin in 1671, and by Tournefort in 1700. C. tetragonum is a synonym by Miller, 1737. It was cultivated by Miller in 1759. According to Noisette7 it reached Europe in 1548. It is called in Hindustani kaffrie-murich, and the fruit, as large as a small apple, is called by the English in India coffrie chili,’ or, according to Firminger, bell pepper. The squash or tomato-shaped, sweet mountain, sweet Spanish and many other similar varieties of our seed catalogues belong to this form, of which the first was in our gardens preceding 1828, as also this and the sweet Spanish in French gardens. There are red and yellow sorts, as in most of the so-called species. This is perhaps the bell of Long’s Jamaica list, as he says it is esteemed most proper for pickling. C. longum DC. is another form usually referred to C. annuum. It reached Europe in 1548, “or before, and would appear to be the second kind, so much esteemed, of De Vega, and the one of the sorts referred to by Ligon as ” resembling a child’s coral.” Corail is yet one of the names for this sort in France. It was grown in England in 1597 and before, as Gerarde speaks of it. There is a figure of it in Fuchsius’ Historia Stirpum, Basle, 1542, under the name of siliquastrum or calicut pepper, and a statement that the plant had been introduced into Germany from India a few years previously. It was in American gardens, by name at least, before 1806, and is the long red or long yellow of our present seed catalogues. C. nepalense Drury is a variety growing in Nepaul, and very pungent and acrid. C. olivceforme Mill.—A variety of C. annuum, and described by Miller in 1752, and by Tournefort in 1700. It came from Barbadoes, and the name appears in Long’s Jamaica list. It may be the sort which appears in our catalogues under the name of cranberry, but other kinds occasionally produce olive-shaped fruits. C. sinense L.—This sort was described by Linnaeus and Jacquin about 1770-76, the fruit yellow. It is cultivated in Martinique. C. tetragonum.—This is said by Booth to be the bonnet pepper of Jamaica. The name appears in Long’s list, edition of 1774. C. tetragonum Mill., 1737, is referred by him to C. annuum L., and also to C. grossum L., to which latter form it appears to rightly belong. It is now cultivated under the name of paprika in Lower Hungary on a large scale, the fruit three and a half to five inches long and three-quarters to one inch in diameter.1 As this is a sweet variety, it is probably C. grossum, which is a form with very variable fruit. The name bonnet pepper is used by Miller, 1743, for C. angulosum, as already stated. C. violaceum Humb. is apparently a variety of C. annuum, but the plant more or less deeply violet-tinted, the fruit black-violet on one side and reddish-green on the other, but becoming red m ripening. It came from Spanish America, and is now an occasional inmate of our gardens. The twenty-two named varieties grown during 1882 and 1883 at the New York Agricultural Experiment Station seem to belong to C. annuum L., and while we are not prepared to affirm that they all can be identified with one or the other of the above named species, yet we think there is probable identification sufficient to justify the conclusion that no strongly marked sorts have appeared during the five centuries of European culture. When we consider that the various kinds of peppers easily cross-fertilize, and hence the difficulty of keeping the sorts distinct, we are led to believe that many of the forms which have received specific description are true agricultural or form-species, sufficiently distinct at their first appearance by discovery to justify a conclusion as to a long antiquity, and as to their power of resisting change. The whole genus needs revision from an agricultural instead of a strictly botanical standpoint. From: The American Naturalist, Volume 19, Issues 5-7. Published for the American Society of Naturalists by the University of Chicago Press, 1885.